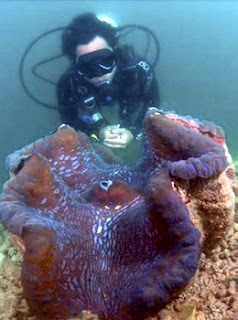 The Giant Clam, of the genus Tridacna, is a striking image on any coral reef. Its size, at two feet or more in length, along with the deep folds in it shell and the vibrant colors of its fleshy mantle make it a standout. 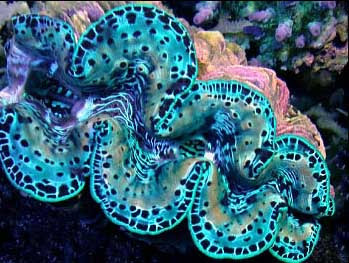 And rather than be the danger portrayed in movies, clamping down on the feet of unsuspecting swimmers, the giant clam is an important member of the coral reef community, a filter-feeder that helps to cleanse the surrounding waters to the benefit of all the reef's inhabitants. In Malaysia, the Tridacna clam has been heavily exploited for decades, either for its meat or shell. And as Malaysia has grown as both a tourist destination and commercial shipping center, water pollution and urban development have taken its toll on the clams and, for the matter, all of the surrounding reefs. However, the Marine Ecology Research Centre (MERC), affiliated with the Gayana Eco resort on Gaya Island outside of nearby Kota Kinabalu, is taking steps to bring the Tridacna back to its former glory. The Centre has patiently been nurturing Tridacna larvae in a nursery to where they are now ready to transplant 500 three-inch juveniles back to the coral reef. Researchers will closely monitor the growth and overall health of the clams in their new environment. If all goes well, they have as many as 2,000 clams in their nursery which could be returned to the reef. Additionally, MERC has been cultivating corals for replanting, as many as 1,000, and are prepared to transplant them in and around the reefs at Gaya Island. Like many other Pacific islands, MERC realizes that much of Malaysia's economic growth is closely tied to tourism. Malaysia is known for beautiful coral reefs that are enjoyed by divers and snorkelers - and that means revenue for the nation and its people. The Centre was awarded the Most Innovative Tourist Attraction Award at the 2008/2009 Malaysia Tourist Awards, so they are not alone in realizing the value of healthy, protected reefs. The Marine Ecology Research Centre will be educating schools and non-governmental groups on the importance of marine conservation while they continue with their giant clam and coral breeding and transplanting activities. Let's hope they succeed on all counts. The Tridacna clam is an impressive reef invertebrate worth saving.